OXFORD, Miss. – A University of Mississippi student is the first to receive a prestigious new scholarship from the U.S.-Japan Bridging Foundation. 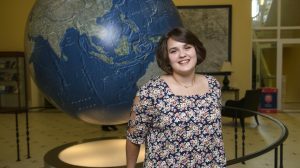 Gwenafaye McCormick, a junior international studies and biology major from Tuscaloosa, Alabama, is the inaugural recipient of the Ira Wolf Scholarship. She will study Japanese culture and history at Waseda University in Tokyo for the 2017-18 school year. The scholarship is named after a greatly admired and respected foreign service officer, U.S. trade representative and, most recently, employee of the Pharmaceutical Research and Manufacturers of America trade group in Tokyo. Wolf died in January 2016 after having spent half his adult life in Japan. “With the support of Ira Wolf’s family and his colleagues in Washington, D.C., and Japan, we created the Ira Wolf Memorial Scholarship Fund to honor his memory,” said Jean M. Falvey, deputy director of the Bridging Foundation. Kaoru Ochiai, instructional assistant professor of Japanese in the Croft Institute and UM Department of Modern Languages, has high expectations for her student. McCormick became interested in learning Japanese after taking a course in high school. That initial exposure led her to pursue a degree in the language, which ultimately led to her coming to UM. “Upon visiting campus, I fell in love with Ole Miss and the Croft Institute,” McCormick said. “I’m very interested in environmental studies and conservation, as well as Japanese. Ochaia described McCormick as “warm-hearted” and a person who can anticipate the needs of others. Wolf was deeply committed to strengthening ties between the U.S. and Japan through his professional work and volunteerism, Falvey said. McCormick is the daughter of Paige McCormick, a professor of English literature at the University of Alabama, and Mark McCormick, vice president of academic affairs at Stillman College. In the past 19 years, the nonprofit organization has supported 1,837 U.S. undergraduate students’ cultural and educational exchanges, providing opportunities for a diverse cross-section of young adults to develop global leadership and workforce skills that will deepen their understanding of Japan and strengthen the U.S.-Japan relationship.